Ryan Burnett (17-0, 9 KOs) battered IBF World bantamweight champion Lee Haskins (34-0, 14 KOs) for 12 round rounds on Saturday night to win an impressive 12 round split decision at the SSE Arena in Belfast, Northern Ireland. One judge had it for Haskins by the score 118-108. The other 2 judges saw Burnett as the better fighter of the two in giving him the win by the scores 119-107, 119-107. Boxing 247 agreed with the 2 judges that scored the fight 119-107 for Burnett. 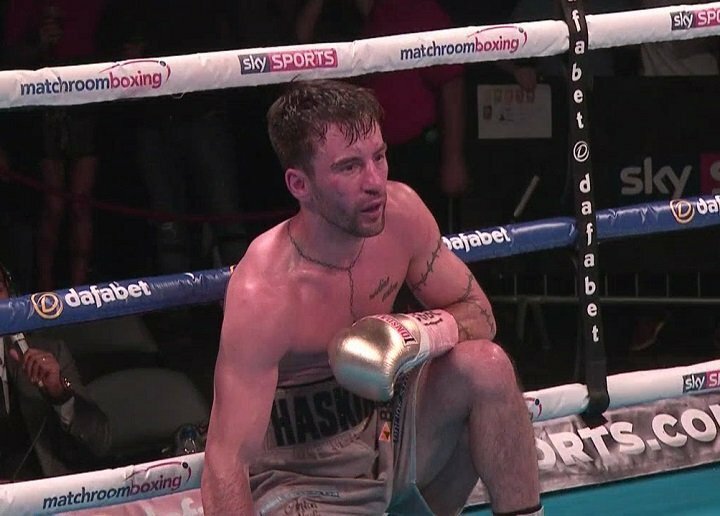 Haskins was knocked down two times by Burnett in the 6th and 11th rounds. Burnett was unable finish off Haskins both times he knocked him down. Haskins didn’t have the punching power or the endurance to deal with the faster shots and the nonstop pressure from the 25-year-old Burnett. The fight slipped out of Haskin’s grasp after the 2nd round, as Burnett was able to score big single shots from the outside over and over. Haskins would occasionally nail Burnett with nice punches of his own, but he didn’t have the same kind of power as the younger fighter. Mike Perez (22-2-1, 14 KOs) looked powerful in crushing Viktor Biscak (10-1, 7 KOs) in a 1st round knockout on the undercard in his first fight at cruiserweight. Perez, 31, knocked Biscak flat with a 1-2 combination moments into the fight Biscak got back to his feet, but he’d suffered an ankle injury. He couldn’t continue. The fight had to be stopped. The referee pulled the plug on the fight at 0:29 of the 1st round. This was a good effort from Perez. He looked in superb condition and a lot thinner than the 240lbs he’d weight in his last fight against Alexander Povetkin in 2015. That weight took place in the heavyweight division. The only problem with Perez’s win over Biscak is it didn’t show us anything. Biscak is not a world class opponent, and it was just a bad mismatch between the two fighters. Perez will need to show that he can beat the better fighters in the division if he wants to go anywhere. Promoter Eddie Hearn wants to move Perez quickly, which isn’t surprising due to his age and the 2-year layoff that he was coming off. Perez needs to fight as frequently as possible for him to get ranked high enough for him to get a title shot. It’s not likely that any of the cruiserweight champions are going to give him a title shot in a voluntary defense. He’s too dangerous, and there’s no real upside in facing Perez. He’s not a super popular fighter.